Product #55635 | SKU 31310472100 (US) | 0.0 (no ratings yet) Thanks for your rating! Genius GX gaming introduces Scorpion, a high-quality gaming experience with gaming peripherals for Beginners all the way to Expert. The Scorpion K9 key combos enable gamers to quickly control media player functions such as volume up/down, pause/play and forward/backward, and shortcuts to e-mail and my desktop without dropping out of a game. 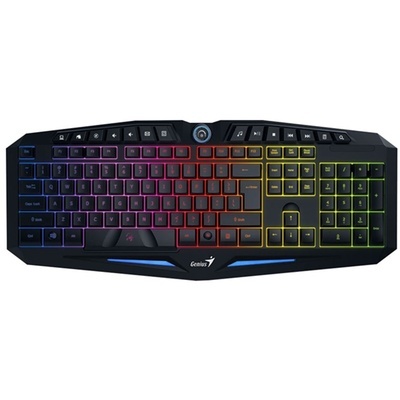 The 7 color backlighting configuration enables you to keep playing and fighting in a dimly-lit or unlit room. A completely ergonomic design for gamers to feel comfortable with the keys and reduces hand fatigue during long playing games. K9 allows up to 19-key anti-ghosting to be registered simultaneously at a keystroke, so you can use multi-key input to execute complex commands or actions at exactly the right time. The unique S-shape keycap and laser engraving gives gamers a great tactile feel with each keystroke. K9 provides the greatest durability with up to 10 million keystrokes, perfect for high-intensity gamers.